Have you ever had the dream where you're...? It is the question that puts Zuckerberg on the proverbial hot seat throughout director David Fincher’s engaging motion picture about the creation – and creator – of Facebook. The screenplay by Aaron Sorkin (A Few Good Men; Charlie Wilson’s War) depicts Zuckerberg as a far-sighted savant on the online medium but also possessing an almost pathologic mixture of genius and jerkiness whose motives for constructing the world’s largest social network are as simple as revenge and the evergreen need for acceptance. It is no accident that this infantile stab at social networking – which was instantly so popular it crashed Harvard’s computer servers – indirectly assailed two groups: girls and the campus social elite. For Sorkin, rejection is the driving force behind Facebook’s genesis – rejection by girls, fraternities, athletes, and the privileged. Facebook was not merely a giant middle finger to Zuckerberg’s supposed tormenters. It was his way of constructing his own fraternal order in an arena where he felt most comfortable: the Internet. It is a club in which everyone is invited, but Zuckerberg is always the gatekeeper. The marriage of Fincher and Sorkin seems odd at first blush. However, Fincher’s dark, deliberate style proves the calming yin to Sorkin’s rhythmic, propulsive yang. The film’s narrative structure essentially consists of scenes from depositions taken during the course of separate lawsuits brought against Zuckerberg, followed by flashbacks to the events that give rise to the testimony at hand. The Rashomon-style format leaves room for the film to present the perspectives of all participants, and for the filmmakers to hedge their factual bets. The first lawsuit is brought by fellow Harvard classmates Cameron and Tyler Winklevoss (Armie Hammer in a digitally enhanced dual role), identical twin gentlemen of privilege and Olympic-caliber rowing champs. This conflict encapsulates not only Zuckerberg’s unease with WASP elitists, but also the age-old clash between nerds and jocks. The irony, filtered through Sorkin’s clever pen, is that while the Winklevosses can be viewed as whiners and borderline buffoons (then-Harvard president Larry Summers does as much when the brothers lodge a formal complaint against Zuckerberg with the university), there’s a legitimate argument that they are truest victims of all, having approached Zuckerberg with the idea for helping develop a Harvard networking website that he would turn into Facebook under their noses. The other civil action, lodged by Facebook co-founder Eduardo Saverin (Andrew Garfield, recently tapped as the new Spider-Man) is more Shakespearean. Differences of opinion between Saverin and Zuckerberg over Facebook’s business model lead to a rift between the former best friends, one exploited by Sean Parker (Justin Timberlake, with relish), the one-time Napster co-founder and tech demigod that Sorkin couches as a smooth-talking scoundrel and leach. Parker coos a siren song of notoriety and billionaire wealth in Zuckerberg’s ear (predictions, it turns out, that were completely accurate) which prompts a spiral of betrayal and legal reprisals. It’s always dicey to write the incomplete story of living people in the prime of their professional and personal lives. In loosely adapting Ben Mezrich’s 2009 book The Accidental Billionaires, Sorkin takes dramatic liberties in his portrait of Zuckerberg. Unsurprisingly, Zuckerberg declined to cooperate with either the book or film, flashing a desire for confidentiality that belies the man who claimed earlier this year that privacy is no longer a “social norm” in the Internet era. 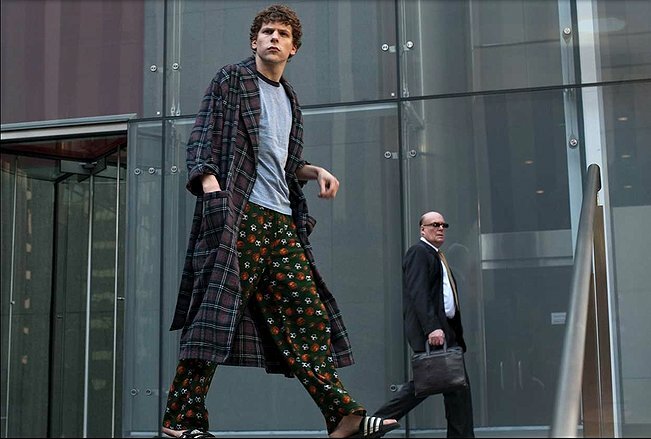 For that reason, The Social Network should not be strictly viewed as a biopic. Instead, it is more a snapshot of a time and place, one of the first films to effectively capture the youthful, technological exuberance that largely defined the aughts. Still, Facebook fanatics and casual users alike will leave The Social Network with a disconcerting sense of knowing how the sausage is made. And, the film does stake his claim as to Zuckerberg’s psyche, one Sorkin believes is not governed by money or fame, but instead by simply wanting a seat at the cool kids’ table – Zuckerberg repeatedly resists Saverin’s efforts to monetize Facebook, insisting the site would “stop being cool.” The irony is this tech-led revenge of the nerds ends up succumbing to the same trappings of ambition, entitlement, and narcissism, as well as emulating the very social caste system they rebel against. 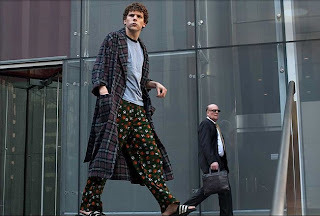 The denouement to The Social Network not only recalls Zuckerberg’s personal Rosebud but also the Faustian fate that befell such movie tycoons as Daniel Plainview, Michael Corleone, and, yes, Charles Foster Kane. Like them, Zuckerberg becomes a virtual prisoner of his success, attaining everything except the thing he wanted the most. The geek may inherit the earth, but that doesn’t necessarily include happiness – or getting the girl.